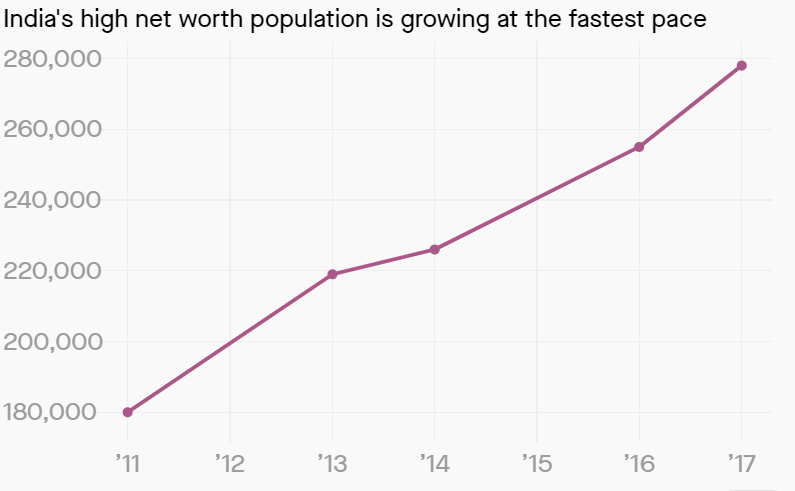 India is adding ultra-high net worth individuals (HNWIs) at a staggering pace. In 2017, the number of HNWIs in India grew 20% year-on-year, higher than in any other country, to 278,000, according to an Asia-Pacific Wealth Report by consultants Capgemini, released on Nov. 28. The overall wealth of these Indian heavyweights also expanded by 20% during the year to $1.1 trillion (Rs77 lakh crore). Capgemini defines HNWIs as individuals who typically have at least $1 million in investment-worthy assets. “In Asia-Pacific, India was the most fertile market for ultra-HNWI population (22.2%) and wealth (23.4%) growth. Comparatively, ultra-HNWIs in the rest of the world managed to sustain a 9.2% population growth momentum and 9.6% wealth growth momentum,” the report noted. “A mix of economic and financial dynamism were the growth propellers for the market. Government stability encouraged favourable business development policies, especially in manufacturing, which resulted in a 30-step jump in ranking for ease of doing business in 2017,” the Capgemini report said. Over the past decade, India’s GDP has more than doubled, and more people have managed to grow their wealth. In 2017, India’s stock market capitalisation increased by 51.3% compared to the previous year while its GDP grew by 6.7%. Not just India, but its peers in the Asian region have also been doing extremely well. “Asia-Pacific continued its growth trajectory in 2017, extending its lead over other regions for HNWI population and wealth. A stellar performance puts the region on a comfortable path to surpassing $42 trillion in HNWI wealth by 2025,” the report said. In fact, in absolute numbers, India lags far behind Japan and China. 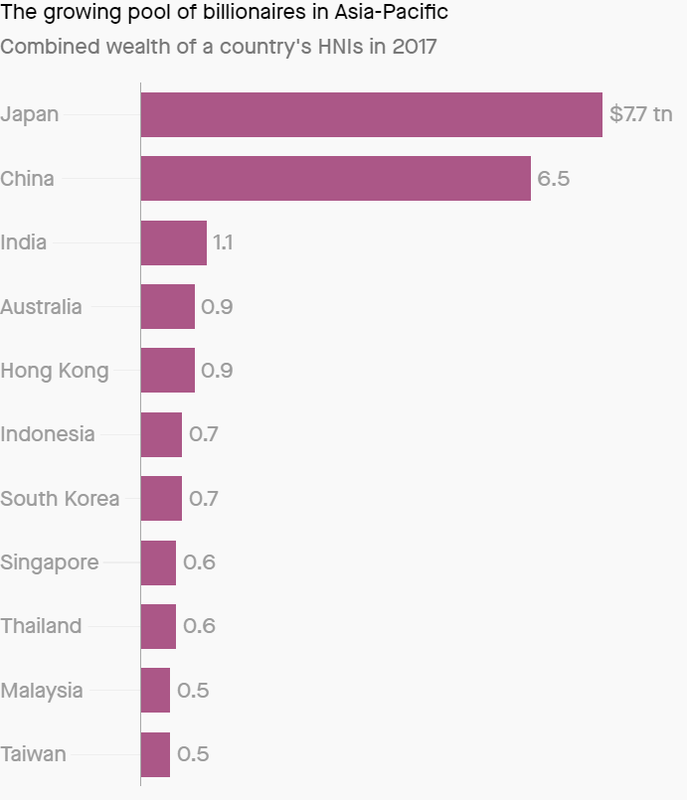 In the Asia-Pacific region, Japan’s combined HNWI wealth topped the list, followed by China and India. Despite their growing wealth, an increasing number of HNWIs in the Asia-Pacific region are unhappy with their wealth managers. Concerns over the lack of holistic services from wealth management firms, perceived low value-add management fees, and a low personal connection with wealth managers were top reasons for this discontent, the report noted.